The EPA Rutgers Raritan River Project was conducted to compile data related to point source and non-point source pollution and Superfund, Brownfield and other contaminated sites into a comprehensive database. In addition, the project developed an interactive tool that assists federal, state, and local stakeholders to make decisions related to environmental cleanup and site reuse, identify pollution data gaps, and provide recommendations for future research needed to fill these gaps. Previously, this data was fragmented, inconsistent, and difficult for the general public to access. 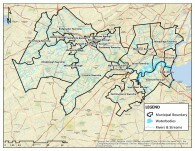 This study encompassed 22 municipalities in the Lower Raritan watershed management area (WMA09). It includes summaries of available data by sample type (biological, sediment, surface water, etc. ), an interactive map, and a library of related journal articles, technical reports and research theses. Interactive mapping of Brownfields, Superfund sites, combined sewer outfalls and other potential sources of contamination in the Raritan River watershed. Data collected by state, federal, and local agencies on water quality, sediment quality in Raritan Bay, and the health of organisms in tributaries draining to the river. Library of reports, journal articles, and research studies conducted in the Raritan River watershed. For more information, contact Dr. Steven Yergeau at yergeau@njaes.rutgers.edu or Dr. Christopher C. Obropta at obropta@envsci.rutgers.edu .